Who’s ready for another simple, delicious entrée recipe?! Please say yes, because this 30-minute Harvest Bowl is calling your name. I’ve called these “Harvest Bowls” because they’re vegetable-packed and the colors remind me of fall harvest. Plus, they’re on the hippy-dippy side, kind of like my Buddha Bowls. This is my kind of meal. This recipe requires just 30 minutes and 10 ingredients to prepare, and the leftovers reheat beautifully, making it perfect for lunches throughout the week. 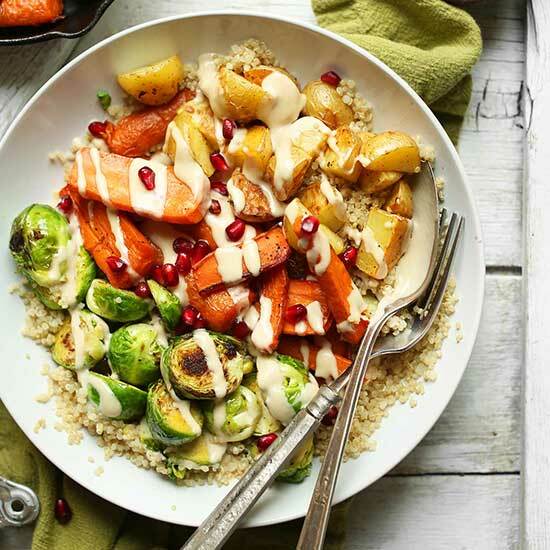 The concept is simple: Brussels sprouts, carrots, and potatoes are simply seasoned and roasted while quinoa cooks to perfection. Then just plate and top with my beloved 3-ingredient tahini dressing, which is creamy, slightly tart, and perfectly sweet. It helps marry the vegetables and quinoa together beautifully. This would make the perfect weeknight meal when you’re craving something healthy yet satisfying. Plus, it’s super comforting, which is ideal for the winter weather we’re experiencing at the moment! Serve as is or pair with Vegan GF Cornbread or a Kale Salad because kale for the win. If you’re into “bowl” meals, also check out my Sesame Eggplant & Almond Butter Tofu Bowls, Ultimate Mediterranean Bowl, Sweet Potato Chickpea Buddha Bowl, Quinoa Chickpea Buddha Bowl, or Cauliflower Rice Burrito Bowl! If you try a harvest bowl, let us know! Leave a comment, rate it, and don’t forget to tag a photo #minimalistbaker on Instagram so we can see what you come up with. Cheers, friends! Preheat oven to 400 degrees F (204 C) and line a baking sheet with parchment paper (or more baking sheets if increasing batch size). Add the carrots and potatoes to the sheet and drizzle with half of the maple syrup, half of the olive oil, the salt, pepper, and rosemary (as original recipe is written, 1 Tbsp maple syrup and 1 Tbsp olive oil // adjust if altering batch size). Toss to combine. Then bake for 12 minutes. In the meantime, heat a saucepan over medium-high heat. Once hot, add rinsed quinoa to lightly sautée before adding water to evaporate leftover moisture and bring out a nutty flavor. Cook for 2-3 minutes, stirring frequently. Then add water and a pinch of salt. Bring to a low boil over medium-high heat. Then reduce heat to a simmer and cover. Cook for 18-22 minutes or until liquid is absorbed and quinoa is fluffy. Then open lid and fluff the quinoa with a fork. Tilt the lid, remove from the heat, and set aside. 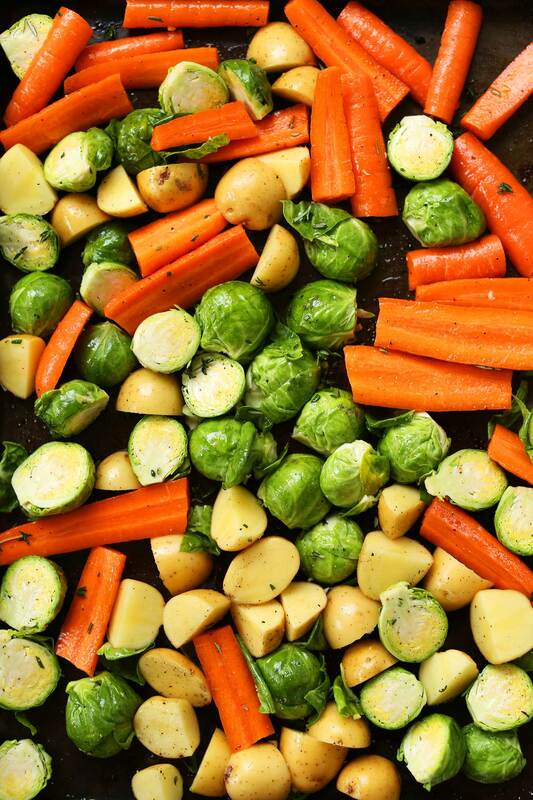 When the veggies are at the 12-minute mark, remove pan from the oven and add the Brussels sprouts. Top with remaining 1 Tbsp olive oil, 1 Tbsp maple syrup, and another pinch each salt and pepper (amounts as original recipe is written // adjust if altering batch size). Loosely toss to combine. Lastly, prepare dressing by adding tahini, lemon juice, and maple syrup to a small mixing bowl and whisking to combine. Add 2 Tbsp (30 ml) warm water at a time and whisk until thick but pourable. Taste and adjust flavor as needed, adding more maple syrup for sweetness or lemon juice for acidity. 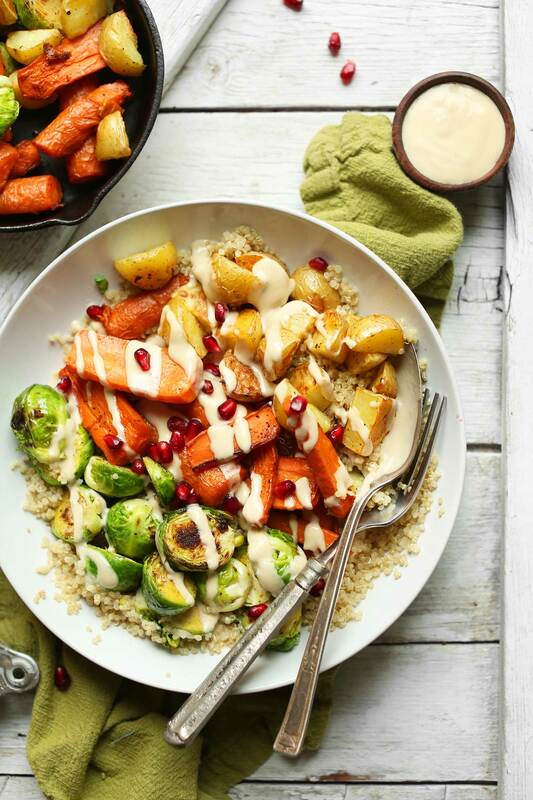 To serve, divide quinoa and vegetables between serving bowls and top with a generous drizzle of tahini sauce. Top with garnish of choice, such as pomegranate arils or fresh herbs. *Recipe (as originally written) serves 3 as an entrée or 4 as a side. *Nutrition information is a rough estimate calculated with the sauce and without garnishes. I stuck to the recipe, except for adding some sweet potato. Was SO delicious. Enjoyed it a lot. Thank you! 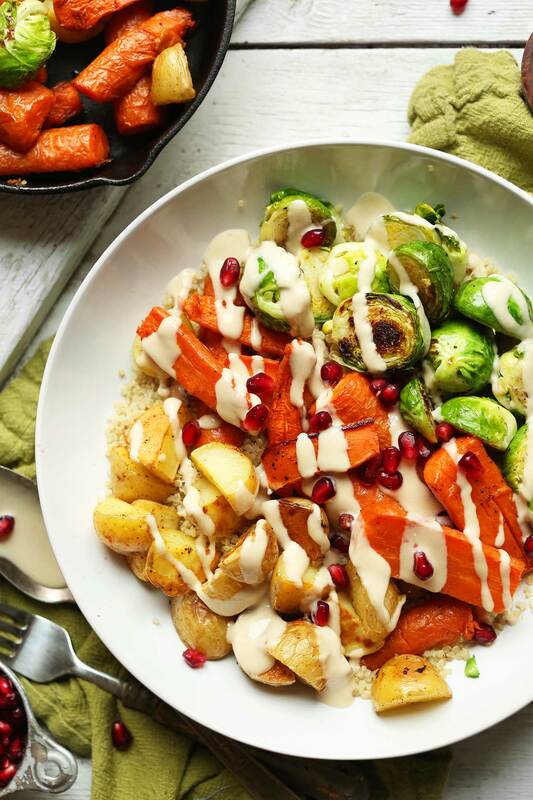 This was seriously an A+ meal on all fronts for me: fluffy quinoa, crispy brussel sprouts, tender carrots, and potatoes all tied together with a frickin good tahini sauce. I followed the directions closely and it yielded perfect results! I served this with a piece of broiled salmon that had a brown sugar and mustard glaze and it was a match made in heaven. I am preparing to go vegetarian during Lent and will keep this harvest bowl on a steady rotation! Yay! We’re glad you’re loving this recipe, Haley! This is really nice, lovely flavours, so delicious! Devided it into four and put the tahini sauce on the one I had the first night then will add it each night I have it. Had to add more water than stated, lovely tahini sauce. Will defo make this again! Yay! Thanks for sharing, Zoe! It sounds like it just needed to be thinned out with some water or almond milk! Delicious! I made this twice – once with the veggies on hand, sweet potatoes and beets. It was delicious. Today I made it just as recipe is written. Delicious! My husband uses the tahini dressing, I like it plain with just a tad of salt and pepper. Your recipes are always delicious, amazing and nutritious. Thank you Dana! I just commented on this talking about my worries regarding tahini, but i just realized your tahini sauce looks much lighter in color than mine did. It’s hard to tell but it also looks like it may be thinner. should it be more runny like a dressing? or the consistency of a chilled royal icing? Mine is closer to the latter. Hi Sarah! Add some water and give it a good mix and you should end up with a similar texture! That’s what I did! I’m confused😂 would a hand mixer give me better results than stirring? Hmm it shouldn’t make a difference.. Is your tahini old perhaps? No! I bought it fresh the same day that I made the recipe. This is my first time using tahini, and the girl at the local grocery store told me to be wary of it due Tibet how bitter it is but the acidity of the lemon with the sweetness of the maple syrup really made it work! It’s so hard for me to find high protein meatless entreés as I am trying to become vegetarian and it’s recipes like this that keep me motivated! This recipe was AMAZING!! So much flavor! That glaze that helped roast the veggies was delicious! I added sweet potato along with all the other veggies as well as increased the maple syrup and olive oil to tbsp. Of course, I did not have tahini sauce on hand so I used olive oil and lemon juice instead. I have to say I did not expect this recipe to be so packed with flavor! Thanks for all your delicious recipes!! Feels like I’m eating Christmas ! We all loved this recipe! It was our first time to try tahini and the sauce was delicious! We are glad you enjoyed this recipe, Julie! I am not a huge fan of bowls but decided I should try to like them- and this one is amazing. I’m not a fan of quinoa so I used couscous instead and it’s amazing! I also subbed red and purple potatoes to add even more color, and didn’t have lemon so used lime juice and it was great! Thanks for this one- it’s definitely in the regular rotation now! Hi! Super excited to make this recipe. I think I got a little confused with the nutrition information though. Is the 530 calories for the whole dish? Hi Allison! It is for 1/4 of the recipe with sauce. Took a little shortcut by adding water & maple syrup to some hummus I made earlier & it was perfect. Your recipes inspire & satisfy! Thanks! I absolutely LOVE this recipe! Any tips on reheating? I see you said it reheats well. The carrots and potatoes don’t get hard or mushy? Yes, this meal reheats very well, Mary! 5 Stars! Made this delicious dish but topped it with a bit of cashew sour cream and BBQ sauce. The sweetness of the veggies roasted with maple syrup makes for a wonderful meal. My husband loved it! Thank you Dana for another delicious, healthy and easy to make recipe! So hearty, and flavourful. Has become one of my go-to recipes! Hi! Do you have any other recipes that are similar to this one in style? I LOVE this one, but the rest of my family is not so crazy about it as they don’t like brussel sprouts. I find the style (quinoa, cooked veggies, and dressing) very nice and easy to do. Thanks! Hi Julia! Glad to hear you love this one. What about this Greek Goddess Bowl as an alternative for your family? Thank you for this recipe!!!!! It is amazing. I don’t like many veggies, but this was soooo good :). I used kale instead of brussels sprouts….because i didn’t have them……and it turned out great. Roasting vegetables makes them so much better. I have never liked carrots (till now) I’m kind of a fussy eater….but today i made this recipe and your carrot ginger smoothie…..which was also good. Thanks again. :) I would give it ten stars if i could. Another amazing recipe Dana! I replaced the potatoes with dry fried halloumi and instead of quinoa I used a microwave pack of mixed grains, but it still tasted lovely. This is the second time I’ve made the dressing (I used it in the Sweet Potato Buddha Bowl recipe too) and it was lovely. I changed the maple syrup for honey as we didn’t have maple syrup in the house. Don’t forget to add salt to the dressing otherwise it’s a little bland. Can’t wait to have the leftovers for lunch. Thanks! This was ridiculously good!! Trying to eat more vegetarian options and this will be a staple for me! did everything as the recipe calls for except sweet potato instead of yellow. definitely sharing this one!! Truly a pleasure to eat because this easy-to-prepare dish leaves you feeling full and satisfied yet not bloated or full of inflammation. Made this for dinner tonight! I had everything but tahini, substituted peanut butter and it was still a really good sauce! Loved it and will definitely be saving this recipe! I LOVE all your recipes ? I never leave comments on blogs I get recipes from. Never. This was so good, I had to comment. Yum, very yum. This recipe was delicious and super easy! I’m definitely going to make this one again! Delicious and so easy! I wouldn’t say quinoa is my go-to grain, but it was perfect here. Will definitely make this one again! I think the sauce tasted like peanut butter and jelly on vegetables! I would probably like your alternative you suggest and maybe add yogurt to it. And hey, your photo couldn’t be showing the tahini with maple syrup. It’s white in the photo. Could you add roasted chickpeas to this at the end ? Or it wouldn’t work very well? Yes! That would be a great addition, Alex! This was outstanding! I added chickpeas tossed with salt, smoked paprika, and olive oil with the potatoes and carrots. Your recipes have made my meat-loving husband a vegan believer. Thank you! I also added some chopped nuts to the veggies. Thanks for posting, will definitely be making this again! i’m a new vegan and have tried several of your recipes that i love. but somehow i wasn’t feeling this one. strangely though, my meat loving husband loved it and went back for seconds. he also normally grumbles about me serving quinoa but somehow loved it when paired with the veggies and sauce…interesting! for the win with my hubz, 5 star rating! Just made this for lunch, substituting a few of the veggies (we had sweet potato, onion, broccoli and red pepper at home). Absolutely delicious and super filling! The tahini dressing is amazing! I made this for my mom because she was craving roasted vegetables and this dish hit the spot! Will be making this dish again in the near future! Love this dish. The sauce is perfect ! My family was not a fan of this recipe. I think the turn off was the tahini sauce. I followed the instructions but it just seemed to taste like peanut butter over veggies and rice and was not appetizing. I think a teryaki drizzle would be something I would use if I make this again. My quinoa came out very mushy although I followed the recipe. Otherwise, it was great and will make again. Yet another tasty bowl, Dana – I love it! My veggies took a lot longer to roast, so I think next time I’d crank it up to 425*. At the store, they had the tri-color little potatoes, so it added even more color to the bowl. Husband and I both loved this one and will definitely make again! I just made this for lunch! It was really delicious and so filling. I used honey instead of maple syrup and red quinoa instead of white. Thanks for the recipe!! I already rated this in a reply to someone else, but this was super tasty! I had less quinoa than I realised – only half a cup, oops – so I supplemented the difference with some rice. Would definitely make again! I’ve made this twice now and guarantee I’ll be making it again. I eat veg but my husband doesn’t, so always great to find an easy meal we both love! First time I made it pretty by the recipe and it was great (probably added more maple syrup since I want measuring, but I prefer sweet). This time I added some cauliflower and used tri-color quinoa, and mixed baby potatoes. I didn’t use any pomegranate or fresh herbs to serve either time, my grocery store can be hit or miss, but it was still yummy! Love how flexible the recipe is, you can easily adjust depending on what you have on hand. I’m excited for the leftovers. Just made this and it was delicious! I boiled the brussel sprouts first for 5 min. to get some of the bitterness out of them and gave the roasted vegetables an extra 10 min. The tahini sauce was so simple but went great with the sweet vegetables and the rice that I made instead of the quinoa. Definitely will make it again. I’m sixteen years old and like to make dinner for my family a couple times a week. Minimalist Baker is my go-to site for recipes that are GF/veg so everyone has something they can eat. I just made this for dinner and it is SO good! I used carrots, broccoli, and cauliflower (what we had on hand) and tri-color quinoa from Trader Joe’s. The dressing was wonderful too! Anything with tahini wins in my family. Thank you, Dana and John! I used broccoli instead of potatoes and I added lemon juice to the liquid to roast the veggies in. I liked your tip on sautéing the quinoa before cooking it. I did not think the veggies needed the added tahini sauce because the lemon/olive oil/maple syrup flavor was so good on its own, but the tahini sauce really elevated the flavor. I also baked some chicken breast in a olive oil/lemon juice mixture with garlic because my husband likes added protein. It was very filling! Will make this again. I made this last night and y’all, this is the bomb! Im eating leftovers now for lunch. SO good! I have made a batch of this recipe twice for lunches during the week — and yum, it is so good! The second time I used broccoli instead of brussel sprouts, and I loved it both ways. This reheats well and really is perfect for a comforting winter meal. It does take me (quite a lot) longer to make than the time given, and I find the vegetables take about twice as long as described to roast. But it’s simple, and I anticipate making this many more times! Delicious! I love healthy, easy bowls to make for lunch to bring to work. I added about 1 tbsp of sriracha to the tahini sauce bc I love a spicy kick! I made this for dinner and it was absolutely amazing! The only sub I made was sweet potatoes for white potatoes. If you’re like me and need a little spice in every dish, touch of cayenne to the roasted veggies does this trick. This is definitely going on my weeknight meal rotation!! And added bonus – the leftover were amazing to take to work for lunch the next day. My mom suggested this recipe and I wasn’t convinced it would taste good because, you know, healthy and whatnot. It is. I will actually voluntarily be making this again! So yummy! I used all the maple syrup I had on the veggies. Would honey be an ok substitute for the dressing? I made this last night and loved the flavor! The sauce was out of this world! I used sweet potatoes and broccoli instead of baby yellow potatoes and brussel sprouts. Thanks for posting! Made this over the weekend and it came out great! Everyone loved it, even the tahini sauce! Ran out of quinoa, so I made with couscous with homemade veg broth and vegan seasoning. Will definitely make again. Everything I’ve made from MB has come out delicious. Everyone thinks I’m a great cook because of Dana! Thank you! ? This sauce is fantastic! Loved the whole bowl, but the sauce made it. Added some water to make it thinner and easier to stir. Made this for dinner last night. I love brussel sprouts. This was fabulous. Even my 88 year old mother loved it and she can be pretty picky some days. Made this for dinner last night. So delicious and filling! Minimalist Baker and Oh She Glows are my absolute favorite vegan food blogs! Never a bad recipe. Thank you! Are there substitutes for tahini itself in the dressing? I’m allergic to sesame seeds and am trying to figure out what other kind of seed or nutter butter would work best (almond? sunflower?) for this and other tahini-based sauces (which always look soooo good!). I made this delicious recipe this evening ….delicious!! I used a combination of white & red quinoa. Certainly a dish I’ll make again. Many thanks Dana! Made this an early lunch/meal prep item today. It was super easy and resulted in a heartier meal than I was expecting. It was a little on the bland side (I did not tops with fresh herbs and pom seeds). Next time I will add a little spice and maybe roasted chickpeas. Overall I think this is a great base for a nice healthy lunch. I missed the step about incorporating warm water into the sauce, and after the addition of lemon juice, the sauce went from silky to thick and grainy. I’m guessing that the warm water would have prevented that from happening? (It was delicious anyway!) Thank you for another great recipe. Hi Kathy! You got it! Next time, make sure to add the warm water and you’ll be good to go! I loveeee Brussels sprouts & carrots. Made this last night without the sauce and potatoes. Used agave instead of maple syrup since I didn’t have any, but it ”twas still delicious. Also wanted to say I put the roasted Brussels sprouts on the skillet afterwards & poured basalmic vinaigrette w/ agave for 5 minutes on med-high to give a flavor. Topped everything off with a squeeze of lemon. I love this! so simple and tons of flavor – fabulous – bookmarked and looking forward to it! If I can’t have sugar, is there a substitute for the maple syrup in the dressing? Or just omit it? Thanks. Whoa…this was perfect comfort food for our chilly Chicago winter. I changed up the veggies a little for what we had on hand and personal preferences: carrots, sweet potatoes, parsnips and kale. All the veggies cooked up beautifully in one batch (love crispy kale!) and so yummy I ran for guilt-free seconds. Btw, your 3-ingredient tahini dressing is the bomb! Made this tonight as is for myself so I would have leftovers to eat for the next few days. As soon as I finished, my meat-loving husband got up from the couch to help himself (he had just told me he wasn’t hungry) and proceeded to eat two helpings. I just have a little scrap leftover for lunch tomorrow. Ha! Very tasty. Pic on Instagram with your hashtag. Just made this and it’s delicious! I just started following you, Dana, and I’m having so much fun with all your recipes! Keep them coming and thank you for sharing your creativity and gift of food! This was DELISH!!! Used butternut squash I/o potatoes. The dressing is soooo good! Thanks! Added in some roasted chickpees, all the family loved it! Thanks! Hi! Just wondering how to store any left over dressing? and for how long? Yummy – I’m such a huge fan of bowls for dinner! Great recipe. Thank you for giving me an idea what to prepare for lunch tomorrow! OOh!! This will be dinner for me tomorrow night!! Thank you for the inspiration! I made this last night and it was soooooo good. I could seriously eat this every day! This was great! It did take a bit longer than stated, as I had to cook the veggies for close to double the time. I have a thermometer in my oven for accuracy, so I’m not quite sure what the issue was. Either way, it didn’t really matter. I also used vegetable broth to cook the quinoa, just because that’s something I always do for a *little* extra flavor, and I used way more veggies than the recipe called for, seeing that a surplus of vegetables is never a bad thing. I’ll definitely add this to my list of favorite recipes. Simple and satisfying as hell. Lovely additions! Thanks for sharing, April! Your harvest bowl is something I could eat every day! The dressing sounds soo good as well! So, I am feeling very lucky today as I had all the ingredients to this meal in the house. And to top it off, I had precious mini carrots of many colors that needed to be cooked up! We loved it! I kept the tahini sauce on the side for hubby bc I wasn’t sure he would like it. He poured it over everything! I did use 1/3 cup tahini instead of 1/2 (personal preference). I also have the yummiest baby kale super greens from costco, so I sautted some with your tandoori masala spice, sale, pepper and olive oil as a side. I made extra veggies, so tomorrow, I am layering quinoa, kale, veggies, tahini sauce. So good. Clean plates and full bellies all around! Pics on instagram shortly! Can you verify that the Nutritional information is correct. 500 calories per serving seems high. Is it the tahini that raises the calories? I believe that’s correct! Tahini does add calories, so cut back there if you’re concerned. This looks so good! I too decided to make a quinoa bowl with all the good winter veggies. Love the idea of adding poms. AND I just bought my first cell phone – welcome to the 20th century, Jude – so I can share photos of my creations. Can’t wait to see your photos, Judi! Although this recipe looks wonderful, I am not much of a quinoa fan. I’ll let you know how it works with quinoa. Sorry; meant to say barley. Any subs for brussel sprouts? Cant eat them. Hmm, broccolini, broccoli, cauliflower, kale!? Is the maple syrup absolutely required for the veggies? If so, is there a non-sugary alternative? Nope! I just love how it helps the carrots and brussels caramelize. This looks so good, going to make this for diner next week!! Question! Do the carrots need to be peeled, or can the peels be left on for roasting (the carrots I’d be using are organic)? Pretty much 75% of my meals are bowls, so I definitely want to try this one! Hi Melissa! If my carrots are organic I just give them a good rinse and leave the skin on. Good luck! 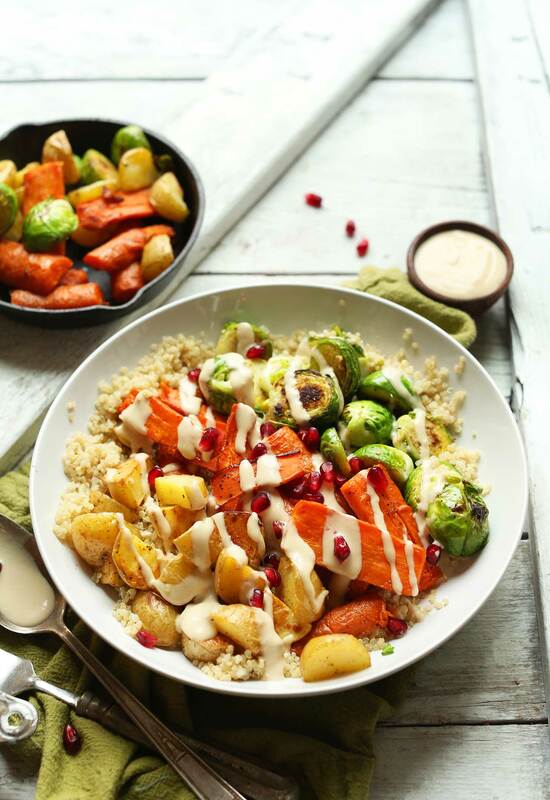 Is there an alternative to the tahini dressing? I simply don’t have any and can’t get to the store. Thx. Hi Jennifer! Hmm, I think that my garlic dill sauce would work here (https://minimalistbaker.com/mediterranean-baked-sweet-potatoes/). Otherwise, just lemon and olive oil would be great! I would say to just lemon and olive oil and that will do the trick! I have not tried hummus in place for this recipe, and am not sure that it would work the same! It never ceases to amaze me how you make veggies look (and taste) so appetizing. That is a gift. Especially with Brussel Sprouts. Wow. I think my non-veggie eating husband will even eat this. And since we decided not to get a life insurance policy for him in case anything happens, I’ve been stuffing him with more nutritious food of late! Anything roasted is so good too and the colors are eye-popping bold! AMAZING!!! I made this last night for myself and the boyfriend! I didn’t have broccoli or quinoa so i added red peppers and threw it over some bismati rice!